This was the first day in the week where my nose was not fully congested (unable to breathe without the aid of a concoction of medicines which eventually escalated to Afrin). In the last couple days of scrounging through the freezer, I had discovered that I had some turkey stock in storage there. 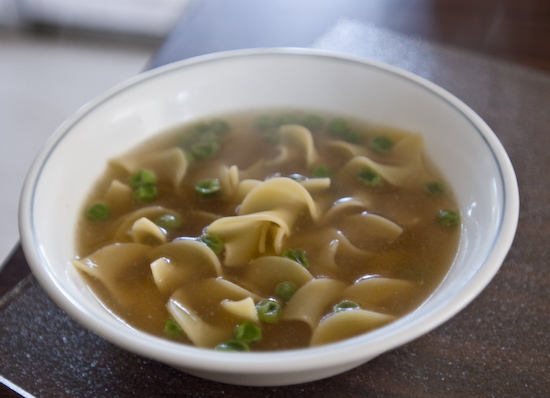 So, when I finally got up in the morning, I melted one of the containers of broth and cooked some egg noodles in it. I wanted fresh carrots, but there were none to be had, so I looked for the frozen kind. None of that either, so in went a handful of frozen (dessicated) peas. I had a couple bowls of the turkey soup for lunch. For dinner, Tina picked up some Chinese food at China Stix (Google Maps) in Santa Clara. We actually really like the food at China Stix - in fact, I proposed to Tina there with a fortune cookie replaced with a personal message. 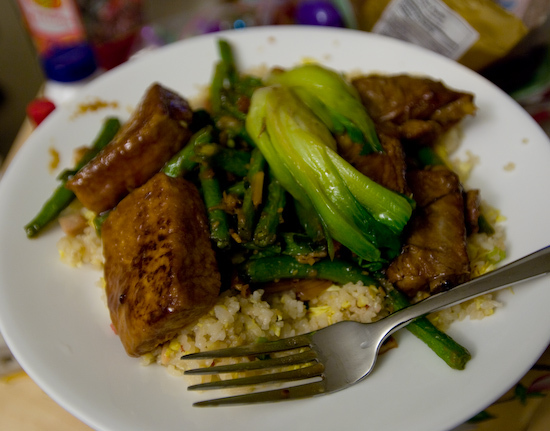 I ordered Hunan Family Style Tofu, Shanghai Spareribs, and Green Beans (and received a frree pork fried rice because our order was over $15) and Tina went to pick it up.